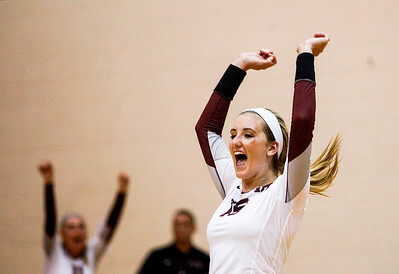 Sarah Nader- snader@shawmedia.com Prairie Ridge's Megan Ozga celebrates a win during Tuesday's volleyball match against Jacobs at Prairie Ridge HIgh School September 2, 2014. Prairie Ridge won, 2-0. 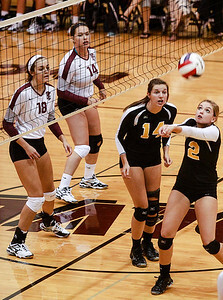 Sarah Nader- snader@shawmedia.com Prairie Ridge's Aubree Eggers (left), Charli Beam and Jacobs' Allie Campbell watch Jacobs' Paige Queffelec hit the ball over during Tuesday's volleyball match at Prairie Ridge HIgh School September 2, 2014. Prairie Ridge won, 2-0. 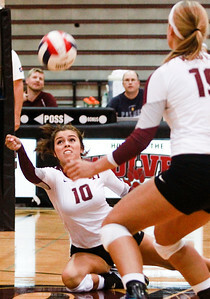 Sarah Nader- snader@shawmedia.com Prairie Ridge's Sofia Miranda dive for the ball during Tuesday's volleyball match against Jacobs at Prairie Ridge HIgh School September 2, 2014. Prairie Ridge won, 2-0. 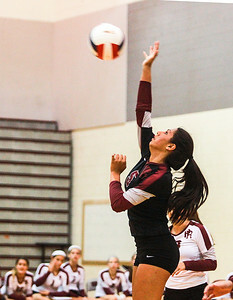 Sarah Nader- snader@shawmedia.com Prairie Ridge's Slone Salerno hits the ball over during Tuesday's volleyball match against Jacobs at Prairie Ridge HIgh School September 2, 2014. Prairie Ridge won, 2-0.